George Anson, 1st Baron Anson (1697-1762), Admiral. Sitter associated with 10 portraits. Charles Grignion (1721-1810), Engraver and draughtsman. Artist associated with 24 portraits. 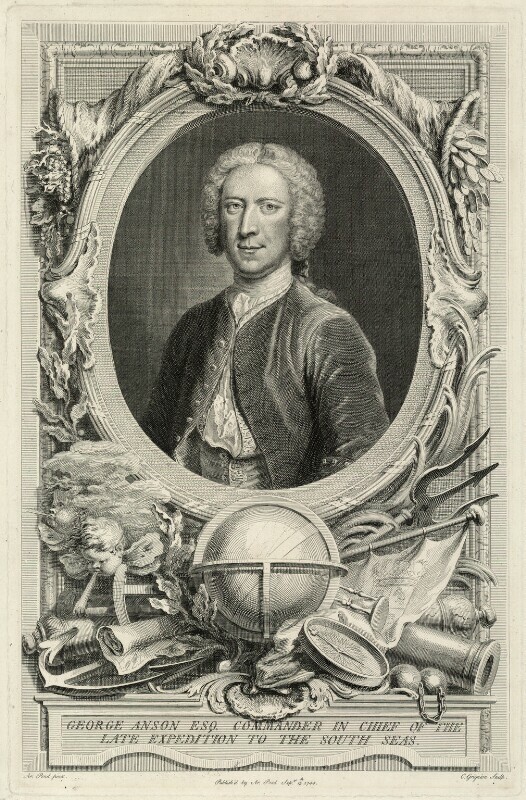 Arthur Pond (1701-1758), Painter and engraver. Artist associated with 32 portraits, Sitter in 3 portraits. John Carteret, 2nd Earl Granville resigns over criticism of his foreign policy. Henry Pelham and Thomas Pelham-Holles, Duke of Newcastle form the 'Broad-Bottom Administration'. HMS Victory is wrecked on the Casquets in the Channel Islands with the loss of around 900 lives. Philosopher David Hume publishes his Essays Moral and Political. First known Laws of cricket are drawn up by a group of noblemen and gentlemen who use the Artillery Ground in London. Navigator George Anson returns home after sailing around the world. War of the Austrian Succession: Prussia marches on Prague, initiating the Second Silesian War. British fleet defeated by a Franco-Spanish fleet at the Battle of Toulon. Bad weather causes the French to abandon invasion of Britain with the Scottish pretender Charles Edward Stuart. The Quadruple Alliance of Britain, Austria, Saxony-Poland and the Netherlands is formed against Prussia.